Cicadas on a 17-year cycle will be emerging this year for the first time since 2000. In most cases, pesticide application is not effective because cicadas travel easily between adjacent properties. Applications are occasionally made to orchards and nurseries to limit damage. 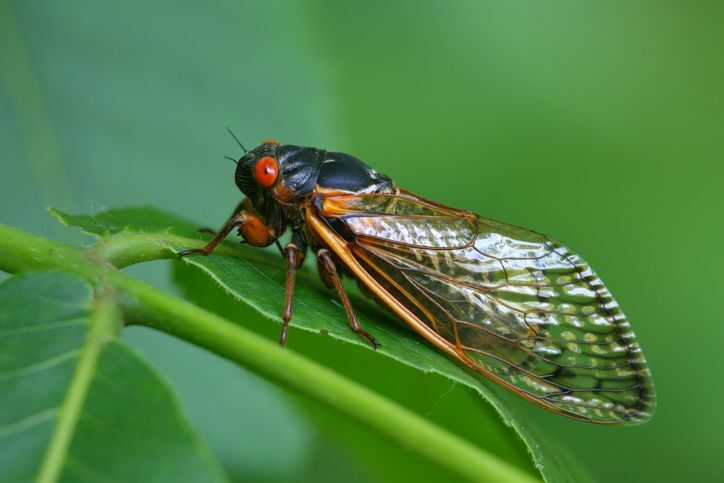 Although application is often unnecessary, you can expect questions from homeowners and companies about cicada hatches. How do I know if I have periodical cicadas? Periodical cicadas are black with red eyes and red wings. Males make a loud buzzing sound when they are trying to find a mate. When will cicadas be most active? Cicadas are most active throughout the day. They will remain fairly inactive during the early morning, evening, and nighttime. Where do cicadas do damage? Cicadas do the most damage to mature plants and trees. While cicadas can damage plants by feeding the most damage is done when they lay their eggs. Female cicadas lay between 400 and 600 eggs each. Once they hatch the young fall to the ground and burrow for another 17 years. How do I protect my plants and trees from cicadas? Is your continuing education due? Check your requirements by state & find approved online courses. This entry was posted in Pesticide and tagged Cicadas, Pesticide.